The 11th Pyongyang International Science and Technology Book Fair opened. On display there are books of contemporary science and technology presented by more than 70 organizations from 20-odd countries, including the DPRK, China, Russia, Germany and Canada, international bodies, overseas Koreans' organizations, individual personages, foreign embassies and missions of international bodies in Pyongyang. 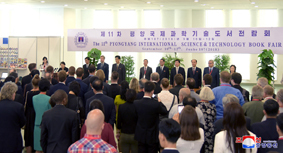 An opening ceremony was held at the Sci-Tech Complex on September 10. It was attended by Pak Thae Song, vice-chairman of the Central Committee of the Workers' Party of Korea, Choe Jong Ho, president of the Sci-Tech Complex, officials concerned, teachers and researchers. Foreign delegations and delegates, officials of foreign embassies and missions of international bodies in Pyongyang were present there. Kim Jong Suk, chairwoman of the Korean Committee for Cultural Relations with Foreign Countries who is chairwoman of the organizing committee of the fair, made an opening speech. The head of a delegation of the China Association for International Friendly Contact made a congratulatory speech. At the end of the ceremony the participants looked round the books and data on display.